Personal Safety Self-Defence programs provide the student with a toolbox full of Personal Safety skills to live confidently in the world – to live a life not ruled by fear. These tools include increased awareness to recognize danger and walk away before it escalates, and dealing confidently with a situation in progress without it escalating to being able to deal with common attacks. 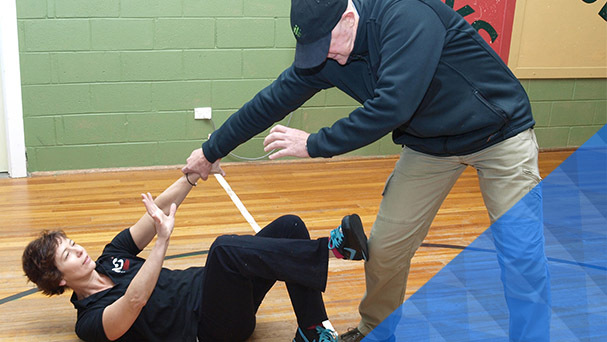 Personal Safety self-defence programs are designed to account for age and gender and the risks associated with the different environments in which we live, work and socialize. Primary-aged school children begin their training by learning that self-defence is far broader than dealing with violent attacks. They learn that to look for early warning signs and choosing to walk away is the most effective form of self defence. By developing awareness and confidence-building strategies they learn to recognize and avoid a confrontation altogether. The focus of a Personal Safety program for this age-group is to increase self-confidence, learn how to deal effectively with verbal assaults and simple responses that children can use to protect themselves against the kinds of confrontations they may experience at school and in the community. We place a strong emphasis on what is an appropriate response to a situation and what is not. The Personal Safety Teen Program focuses on defining the perimeters of safe, appropriate and acceptable behaviour from others and from themselves. Once teenagers have a clear understanding of appropriate behavior they will learn to draw invisible lines to protect their physical and emotional well-being. Investing time in setting personal standards makes it crystal clear when someone crosses the line. This helps to eliminate any anxiety of how to respond as they have already made their own rules. There is particular emphasis on awareness training to help teenagers learn to recognize dangerous situations before they escalate and when it is necessary to walk away. The Personal Safety Teen Program takes into account that boys and girls face different issues and therefore have different self-defence requirements. For a portion of the Program boys and girls will separate to address issues such as when to leave a situation, when to stop drinking (for example), how to make their values clear and insist on others respecting them. Each group will identify adverse social and physical situations that may occur and learn to make choices in advance about their personal values and responses. They will then explore physical self defence responses to the different scenarios they could typically find themselves in. Workshops for Groups – get your work colleagues or friends together and we will do a program for you, either at your place or ours! The Personal Safety Women’s Program focuses on women allowing themselves to trust their instinct and having the confidence to act on that knowledge. Many adult women today have been socialized to believe that being assertive is seen as being masculine and aggressive. Assertiveness training is an essential tool for a young woman to learn. Sharpening confidence strategies and learning to trust instinct are a powerful combination to deflect a potentially dangerous situation. What is the social or physical coercion being used against me? Is force required? What are the options if not? How much force is necessary to escape a particular danger-level and physical situation?